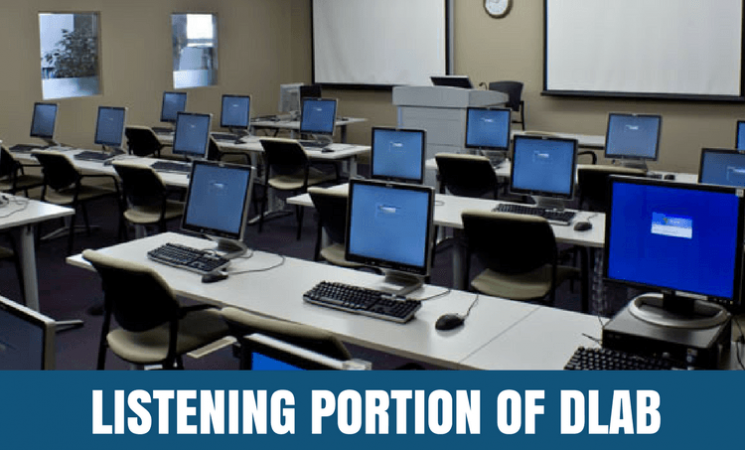 In the article “How is the DLAB Test Organized” we discussed the basic layouts and what to expect on the Listening portion of the DLAB Test. While this portion may be harder to some than others, there are tips and recommendations that can really help you as you dawn the headphones and hit the play button. Before hitting play, make sure your headphones are adjusted correctly and working properly. You may roll your eyes at this simple tip, however, understand that you might be engaged in this portion for a significant period of time and any limitation or discomfort can inhibit your concentration and we assure you, you will need to concentrate. When choosing a desk to take you test (that’s assuming you have a choice), choose one that is away from a window or away from the fan/air conditioner/heating unit etc. Basically, choose the quietest seat in the room. You may not think this is important but sudden noises, regardless of the decibel, can cause you to lose focus and perhaps miss a choice in the multiple choice questions. THE LISTENING PORTION ONLY PLAYS ONCE!!! Do not forget this because it could cost you the very first question asked. So when you hear a word make a quick assessment or else otherwise you will miss the next word. As the speaker says the four options, it is best to tap out the syllables on the desk or your leg so as to keep count. This will help you in case one word has more syllables or it will help to define certain stress sounds. The Official DLAB Study Guide actually has all the grammar rules that will be used in the test. It is well worth it to buy that study guide so that you can memorize the grammar rules and also use the practice test in the guide to get familiar using them. Not only will you be prepared for this section, which is a large part of the test, but you will have a good frame of mind and shouldn’t be flustered as they rapid shoot of new rules to remember in the next portion. These are our recommendations and tips but if you have any others that you would like to share, please comment below. We are always looking for new ideas and recommendations. If you want to be anonymous, then just go to the DLAB Contact Page and send us a message with what you believe would help our readers.